Walking the beach daily develops a deep appreciation for the space where the ocean meets the sand, and the daily changes that take place. This particular piece is available in print only, either on plexi or aluminum or canvas. The piece shown is on aluminun. 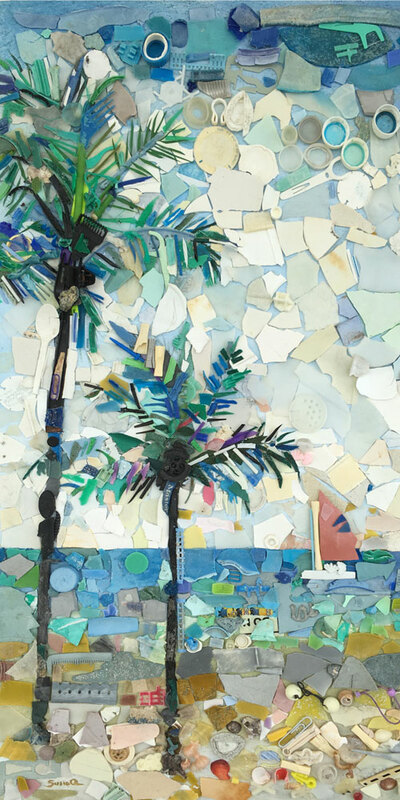 It was created for a visitor to the area who wanted to have a piece to take to her home state in central U.S.A. She collected some seeds and shells from the local Fort Lauderdale beach. Most of the objects are small pieces of plastic I picked up during my regular morning walks. I really enjoyed working on this piece. Original is available and FOB Broward County, Florida. Shipping is extra and the artist will be happy to give you a quote. $375 for the print on aluminun, about 10" x 20". Ready to hang.